Before leaving Savusavu we loaded the boat up with aid for Taveuni and Vanua Balavu. We learned that many of the villages lost everything and Sea Mercy were still in need of boats to deliver aid and make water. 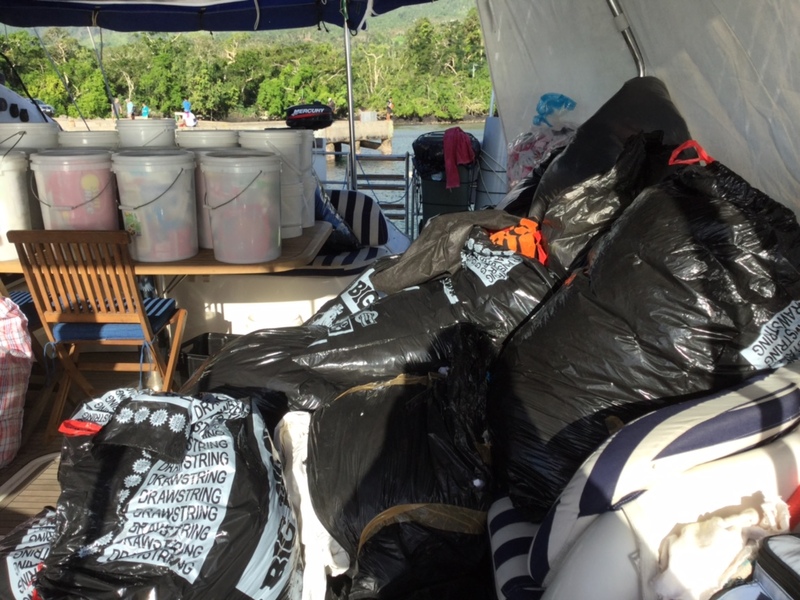 Our first stop was to Taveuni Island to what we soon discovered was not a yacht friendly wharf. The organisers for distributing aid on the island arranged to meet us with 2 utes and were there to help us tie up. Ron put the anchor down and tied the stern to the wharf. 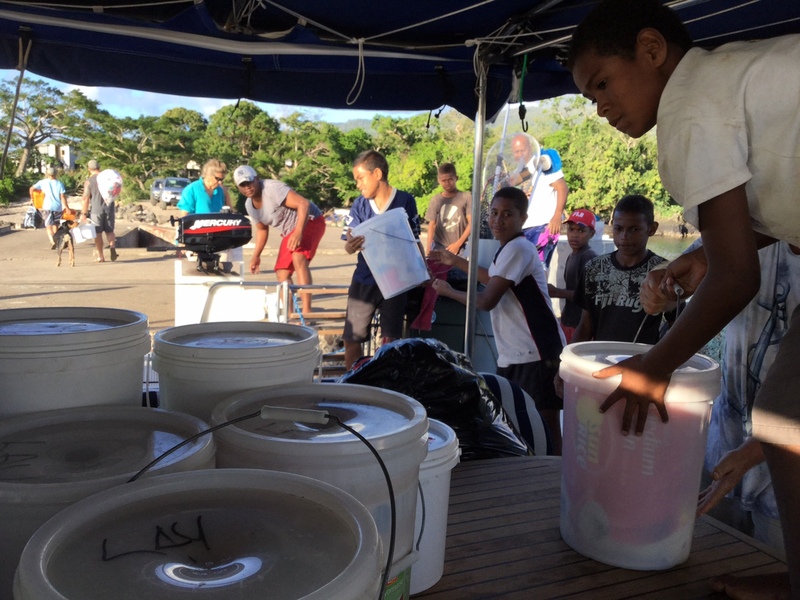 A group of young Fijian boys jumped aboard and created a line to pass the bags of aid along. Made short work of it! From there we anchored the night in Viani Bay 4NM across the Somosomo passage to Vanua Levu. We were welcomed by a pod of pilot whales that I first thought were dolphins. But they were black and their fins and tails were wrong shape. Viani Bay is a beautiful spot and a safe anchorage. It is reportedly very good snorkelling but we decided to continue our journey to the Northern Lau group with the intention of returning on our way back. We carried on around to Sau Bay where our friends, Cathy and Harry, recommended and thought we might stop there. The wind was blowing straight in and we were not that comfortable anchoring for the night so, we once again decided to press on. From Sau Bay we crossed back over the Somosomo passage and rounded the top of Taveuni. There is an island on the Eastern side called Qamea Island where we anchored in a bay about halfway down called Naiviivi Bay. It has a very shallow entrance with a narrow channel to the anchorage behind but it is well marked and a very beautiful spot. It was another 50NM to Bay of Islands, Vanua Balavu and a bit of a slog getting there as it was on the nose all the way. We were able to tack a bit when the wind was in our favour and the trip was certainly worth every bit of the slog! Once again, we were welcomed by pilot whales in the Nggilanngila Passage in to the Bay of Islands. It really was like Thailand without the steroids. Very beautiful scenery with mushroom islands and peaks. The weather was not fabulous but we had a couple of days to ourselves to explore after helping out the villages with aid and making water. We now fly a Sea Mercy flag after our efforts with relief after Cyclone Winstone. 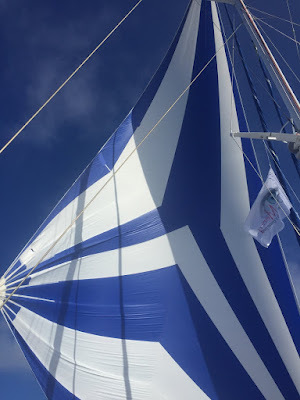 It was a good sail back with the wind behind us and we were able to sail most of the way over 2 days, getting our big Code Zero sail out. Fabulous! Got into Savusavu at 6.00pm with a storm hot on our heels! We will stay here until we get a better weather window and make for the passage through the reef out of Vanua Levu to destination unknown until we see what the wind is doing.